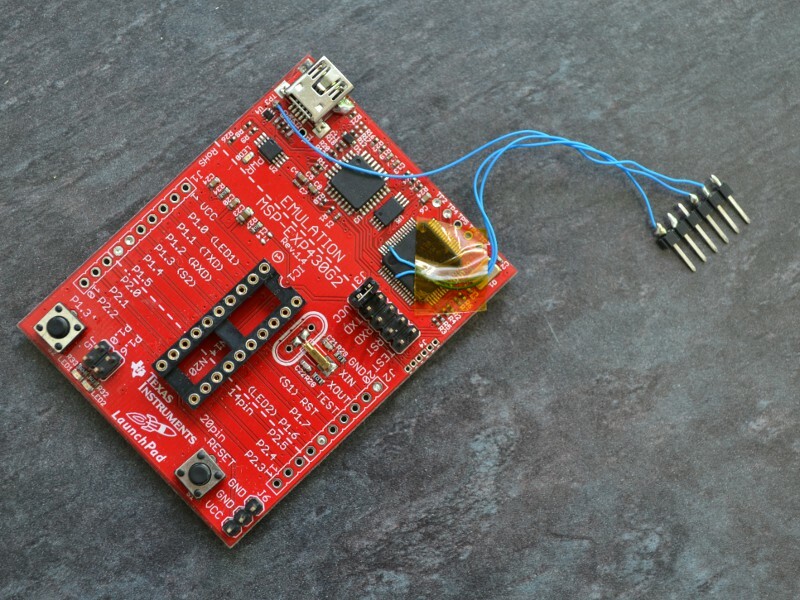 The TI MSP430 Launchpad is a cheap MSP430 development board – about £3 when they first came out, although a bit more now. I think mine was a freebie from a distie. Although I quite like the MSP430 I do tend to use either AVR or some kind of ARM for most of my projects, so it hasn’t really seen much use. The built-in emulator consists of a TUSB3410 and an MSP430F1612, pre-programmed with TI’s own MSP430 “FET” debugger. My aim here is to end up with a debugger that I can use with TI’s CC1110 chips used in the Ciseco SRF. The GoodFET project can talk to these using its Chipcon module, and this has at some point in the past been made to run on the Launchpad. The output ‘goodfet.hex’ can be found in the current directory. Reprogramming the 1612 could be done using another MSP430 debugger, such as another Launchpad board, but I only have the one and I wanted a quick solution. The 1612 includes TI’s Boot Strap Loader (BSL) in ROM. This can be accessed via a serial port on some random non-UART pins that don’t connect to anything on the Launchpad. They can be picked up from the chip itself with some thin wire and a steady hand. I terminated them on a 6-pin header for connection to an FTDI TTL-232R-3V3 lead. The ground can be picked up from a test point next to the USB socket. The GoodFET hex file can now be loaded into the 1612 via the serial port. I did this on Linux using the Python MSP430 tools (‘python-msp430-tools’ on Debian/Ubuntu-like systems). ‘mspdebug’ doesn’t seem to work because its BSL support is only for 5xx and 6xx series chips. Obviously the jumper links connecting the emulator to the target socket need to be removed for this, although leaving the Vcc jumper in place is a good idea as it allows target power to be drawn from the three pin header in the bottom corner. What to do next is a topic for another post! This entry was posted in 8-Bit, Embedded, Hacking, Uncategorised on June 21, 2013 by Mike. Well done! Have you tested to if this setup is able to flash a other bootloader to a a chipcon chip? I assume so. I’ve used it to load custom firmware onto a ciseco srf stick, which uses a CC1111. I’m having trouble invoking BSL mode, the combination you mention should be done while being powered by the ft232 chip right? Does timing matter? I will need to check my notes. Timing isn’t that critical, in that you can do the sequence really slowly and it will still work. I did find there was a knack to it though and it wouldn’t work every time.